For Roger Kluesner, philanthropy is a family tradition. Since his childhood days of distributing food to others in the community, Roger has maintained the philosophy that everyone has something to give,and giving comes in many different ways. His organizational and strategic planning skills, as well as his personal ﬁnancial resources,continue to help Story County and other communities thrive. As the need for a renovation of the Ames Public Library reached a critical level, Roger took the lead in the effort to integrate the Friends of the Ames Public Library and the Ames Public Library Foundation,a move that was vital to the success of raising funds to help pay for the renovation. In addition to leading the newly formed Ames Public Library Friends Foundation, he also led a campaign that raised over$1 million for the project. 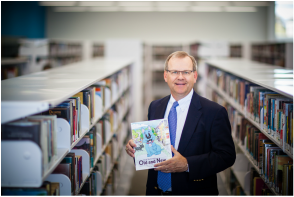 More recently, Roger co-authored a book,Dog Tales Too: Old and New, on a volunteer basis, which beneﬁts the library’s literacy program and other future projects. Roger’s time and treasures have also beneﬁted United Way of Story County, local food pantries in Ames and surrounding communities, and the Iowa Prescription Drug Corporation,an organization that distributes millions of dollars of free prescription medications to Iowans. Bethesda Lutheran Church shows what it truly means to be a good neighbor in Story County. Service is a passion for this congregation that uses philanthropy, advocacy and community ministry to impact many critical issues, such as food and clothing distribution, social justice and mental health needs, environmental stewardship and education. 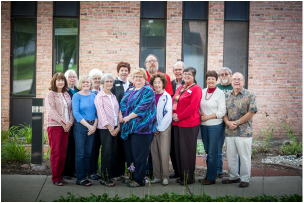 As a next-door neighbor to LSI’s Beloit campus for 50 years,Bethesda Lutheran Church has donated more than $35,000 in recent years to LSI’s human services programs. In addition,individuals at Bethesda have donated more than $711,000 to LSI’s programs, as well as funds to help build the Beloit Residential Treatment Center to meet mental health needs of at-risk children. Bethesda has enabled these children to attend special activities,such as horseback riding camp, and helped found and support the Beloit Learning Garden. This garden provides fresh produce for children at Beloit as well as the Bethesda Food Pantry, which distributes 10,000 pounds of food monthly. 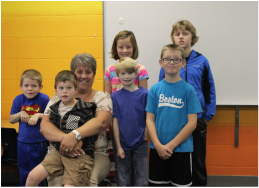 For more than 20 years, the students in Mrs. Nielsen’s special needs class in the Roland Story School District have held penny drives throughout the school year. Students travel the building and collect pennies, change and other monetary donations. Students are responsible for counting the pennies and then take a ﬁeld trip to a local bank, which varies each year. The students are responsible for setting a budget and then deciding how best to distribute the funds. Students work with their teacher to set project goals. They then work with store associates and with agencies who will receive the donation to make purchases. The students raise between $400 and$500 annually. In the past, donations have been made to local food pantries, a stove for the school kitchen, books for Character Counts, and gifts for the residents of the ACCESS Shelter. In 2013, students went shopping at Target and purchased gifts identiﬁed on a list of needs for the Roland Story Angel Tree program. The Ames Police Benevolent Association (APBA) was incorporated in 1934 as a means to provide ﬁnancial death beneﬁts to its members. It has since grown to become a philanthropic entity that supports the citizens of Ames and Story County through volunteerism and generous ﬁnancial support. The Association hosts fundraising events each year, a Pancake Breakfast, a Golf Tournament and Shop With a Cop, as well as an annual direct mail campaign and ongoing t-shirt sales. With these successful fundraising efforts they have been raising over $50,000 annually since 2004. In the decades since their intensive fundraising efforts began, they have raised well above $700,000. These funds are and have been distributed among numerous non-proﬁt organizations, programs, and initiatives that beneﬁt citizens of all ages in Story County including Ames Girls Softball Association, The Arc of Story County, the Boys & Girls Club of Story County and Heartland Senior Services. The APBA also generously supports local programs such as City of Ames Angel Tree, Shop with a Cop and Back to School Night on National Night Out. 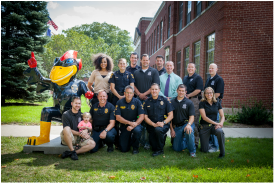 The Ames Police Benevolent Association stands out because they have contributed consistently for decades, in large quantities, without expectation of recognition in an effort to improve the lives of the citizens of Story County. 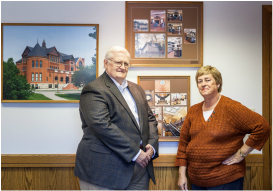 When there is a need, the people of Story County can count on Julie and Harold Pike, long-time owners of Harold Pike Construction Company. In 2011 they committed to be ongoing lead sponsors of the Story County Reach Out and Read program in order to help build a solid foundation for learning among preschool-age children. Their annual gift of $3,000 allows Raising Readers to purchase high quality children’s books in bulk and at steep discounts. These books are given by doctors to children at their 3-year-old pediatric checkup.Their donation has provided over 4,000 different children with attractive new books.The Pikes are also generous supporters of Bethesda Lutheran Church where they have been active members for over 40 years. In 2009, they donated $10,000 for a consultant study in order to keep the church’s geothermal energy system project moving forward. They also regularly support the Bethesda Food Pantry and ﬁll in with personal funds when food supplies run low. When fruit is needed for Thanksgiving and Christmas gift bags, the Pikes always chip in for extra crates of oranges. Duane Lien, the food pantry’s manager, appreciates the Pike’s ﬁnancial contributions and also stated if the Pikes can’t contribute or volunteer, they ﬁnd somebody who can. The Pikes have shared their time, talent and treasure with many other nonproﬁt organizations in Story County. As Ames Morning Lions Club members, they are involved in serving a meal at the Boys & Girls Club once a month. They participate in screening eyes of children at preschools in Ames. Harold, as a member of the Heartland Senior Services Board, has provided invaluable support with professional expertise and pro bono time. When Julie and Harold ﬁrst became Reach Out and Read sponsors, they chose the motto “Building Futures” for their book labels. In many ways, this simple phrase captures their values and how they live their lives. Julie said, “My philosophy is to be a good listener and then envision a way to accomplish helping others.” The Pike’s quiet generosity and positive impact in areas of education, income and health have beneﬁted many community nonproﬁt groups and individuals and will continue to have a positive impact for years to come.